Cheryl Beth Wilson, a nurse at Cincinnati Memorial Hospital, finds a doctor brutally murdered in a secluded office. Wilson had been having an affair with the doctor's husband, a surgeon, and now she is a "person of interest" if not an outright suspect. But someone other than the police is also watching Cheryl Beth. The murder comes as former homicide detective Will Borders is just out of surgery. But as his stretcher is wheeled past the crime scene, he knows this is no random act of violence - in fact, it has all the marks of a serial-killer case he supposedly solved years before. Unable even to walk, Borders starts to investigate, teaming up with Cheryl Beth, who is desperate to clear her name. But as the killer grows closer, the two are running out of time to unlock the secrets of the murder at the brooding, old hospital. ©2009 Jon Talton (P)2009 Blackstone Audio, Inc.
A waste of a credit, definitely! What did you like best about The Pain Nurse? What did you like least? What could Jon Talton have done to make this a more enjoyable book for you? Named it something that wasn't misleading. The story had nothing to do with Nursing. Who would you have cast as narrator instead of Lloyd James and Marguerite Gavin ? Was The Pain Nurse worth the listening time? Definitely not worth the credit or the time. I am a Nurse and thought the title sounded interesting. The title had nothing to do with the story at all. I really enjoyed I just could not stop listening until the end of the book. I am looking forward to Jon's next book. I would not suggest it to anyone. If you’ve listened to books by Jon Talton before, how does this one compare? This is the first and last. Would you be willing to try another one of Lloyd James and Marguerite Gavin ’s performances? What character would you cut from The Pain Nurse? The pt that was a police his wife seemed to be insufficient. This book had more racial comments than I care for any type of entertainment. It was very clear how the author feels or portrays different races. I was most offended and totally turned off by the author and the title was misleading and boring at times. I completed the book to make sure my review was accurate. Easy to listen to. Intriguing plot. Plausible characters. Will be looking for his next book. I read the sequel first "Powers of Arrest" which I enjoyed more. This was good also except it ended much too aburptly and there was a break in the continuity of the stories. It was easy to listen to. I liking both cop and medical field books this book held my attention. I enjoy good character development, but in this case, 80% of the book was character development with only 20% dedicated to developing the story. The result was that much of the character development was repetitive and the story development was thin. It was like saying "The Butler did it" during the first few chapters and then spending the rest of the time on the characters. The story itself could have been very good if it hadn't been so abbreviated. This is my first book by this author and I probably would not order any more. 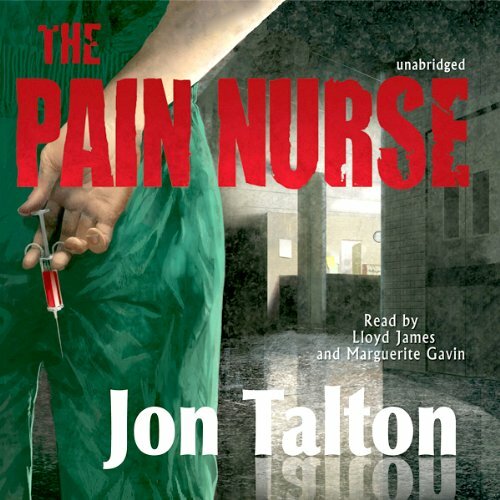 Where does The Pain Nurse rank among all the audiobooks you’ve listened to so far? It is up there with the best. The story keeps moving, with not too much location and person descriptions which can become boring. What other book might you compare The Pain Nurse to and why? None as yet..it is the first medical/drama I have had. Have you listened to any of Lloyd James and Marguerite Gavin ’s other performances before? How does this one compare? Had a healthy respeact for patients and their pain. Book was a bit too predictable. Has The Pain Nurse turned you off from other books in this genre? Do you think The Pain Nurse needs a follow-up book? Why or why not?